The #bitcoinpizza challenge was an attempt to help the community think more about the nature of money and where it comes from in the Steemit ecosystem. It's a tough question, and I'm very grateful to those of you who took up the challenge. Putting this out there was risky for me. At first I was worried no one would reply. Thankfully, 10 of you did. I had trouble picking my favorites because there are so many different angles to take. Some were detailed explanations, others were great conversations, while others were just downright hilarious. I wanted to make sure everyone who contributed got something. I decided to go with four prize levels. For those who participated: my rankings are arbitrary and don't necessarily reflect the quality of your writing or of your ideas on money. If anything, they're probably influenced more by whatever I ate for dinner tonight. Either way, I picked some I liked so we can wrap this up. After posting this, I'll send each of you Steem Backed Dollars for your efforts. The introduction post for this challenge made me 217 SBD and my own entry made 16 SBD (not including any Steem Power). That comes to 233, which I then doubled and rounded down to 465 SBD for the total prize pool. Steem: Where DOES the money come from? This was actually written a month ago, so it didn't have the #bitcoinpizza tag, but it was entered via the comments, and I'm allowing it because it's just such a great write up. If you haven't already, go give it a read. 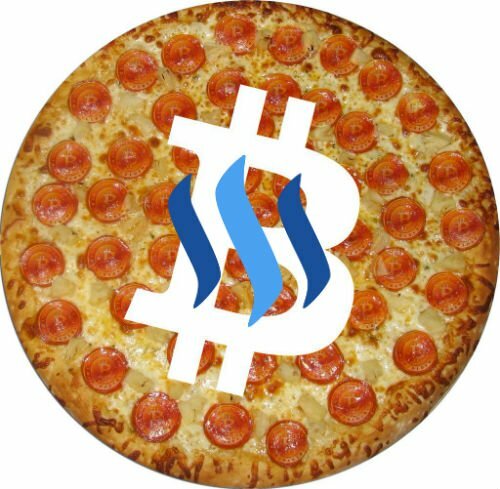 Here's My #BitcoinPizza Challenge Entry--Where Does Steem's Value Come From? @ajvest's Reply: Where Does The Money Come From? bacchist's Reply: Where Does The Money Come From? Akas answer -- "Where does the money come from?" @arcaneinfo Reply: Where Does The Money Come From? You might be asking, why did Luke spend his own money on this? That's a good question. I'm not really sure. I am sure that I want more people to think about and question their own understanding of money. So many people work every day to earn money and pay bills without even thinking about what it is. I'm hopeful Steemit can change this. It won't come about just through technology. It requires that we, as members of the community, continue to challenge our own thinking and skill up. Where does the money come from? A look into the economics of Steem. I hope you'll take the time to read through these and continually skill up your understanding of how Steemit is creating a new form of money. This money won't be backed by coercion or government decree. It won't be controlled by intentionally convoluted, cronyism policies. It won't be restricted to imaginary physical boundaries. The future money of Steemit will be what we make of it. Let's get our understanding right from the beginning. Thanks again to everyone who participated and put themselves out there to better understand money and think through how to explain it to their friends and family. Thanks again to those who posted their #bitcoinpizza entries. I hope it was worth your effort! I appreciate what you do for our community and wanted to say Thank you again! This is a great initiative helping people to understand Steem what Steem is all about. Thanks @ajvest! I really appreciate your comment. I'm not sure if I'll do another one as I'm not a big promotional person. I feel like I don't yet have enough influence and reputation to run a contest like this again (yet). Maybe that will change in the future, but for me this was an experiment to see how it would turn out. I gave out a lot of rewards because I really do care about this topic. I hope others will certainly keep the conversation going. damn, can't believe i missed this. Excellent posts, @sigmajin! I'm sorry I didn't do a better job of promoting the contest. I didn't even know I had been mentioned in your post! Hopefully notifications and follow lists will be implemented soon. I upvoted and commented on both of your posts. Thank you so much for sharing them here. nah it was all me... the past couple days have been an insane hassle, and i really havent been on steemit that much to notice... Hope everyone will take a look, especially at the second and third one (im writing the third one now), because understanding the concept of the vault is really key to understanding how steem works. Dude, i have pictures and arrows and everything... thats supposed to make it simple. TBH, if youve already read it, just think about the notion of the vault... thats what broke it open for me. Because the vault basically controls everything. you can understand how mining works, and the 9-1 number that everyone uses but no one really gets. Once you understand mining, you can understand how bloggers and other contributors get paid. Once you understand the 9-1 ratio, what it really means, you can understand SP "interest" and why dan's balance is increasing by 700K a day. You're welcome! Thanks for being a part of this experiment. Thank you for your generosity, it gave me a 50% boost! Now that's exciting! I love hearing about the wealth being spread around, and it's fun to know I played my small part. I read pizza and you bet i was going to take a look. Just logged in to see that I'm $25 SD richer. Thanks so much! Thank you for submitting an article! If anything, they're probably influenced more by whatever I ate for dinner tonight. Hah! I should have. @corinnestokes actually made soft tacos with her custom taco spice. Always a winner! I really thank you for this challenge, and I am very proud that you appreciated my post! You're welcome! Thank you for participating. I always love when philosophy, thought, and money come together. Thanks so much @lukestokes! Really appreciate the reward and next time we meet up a pizza pie's on me. Thx! Thanks @klye. I definitely appreciate the encouragement. I probably won't do another one like it, but I learned a lot from the process, and I hope it was helpful. 465 SBD will buy a lot of pizza. The participants deserve it! Thanks for the challenge. You made me think l, which you seem to have a gift for (both thinking and making other people think). Thanks Jason! I really appreciate you participating, especially given your recent payout experience. Incredibly generous of you to double the proceeds from your post to fund the prize pool! Thanks @bacchist. It may not be as much prize money as the photo contest, but know the authors worked pretty hard on this stuff, and I wanted to do what I can to reward them for that effort to show my appreciation. Thanks for the shout-out @lukestokes. Surprised I didn't see this post earlier, but I'm gonna have a look through those other posts you linked to, to gain some more perspective. Steemit is like the elephant in the fable, where each blind man touches a part and proclaims that he knows what an elephant is. With time and teamwork, we might understand it more completely. Yes indeed! I worked on a post tonight I'm really excited about which talks about a script I built to analyze the money flow into and out of this system. It should be quite interesting for everyone to see. I hope to publish it tomorrow. Very cool... that might silence the Ponzi-sayers, or confuse them even more.